Join me at the one mobile conference focused 100% on enterprise solutions — including my favorite segment of the mobile industry: M2M or machine-to-machine. I’m looking forward to hanging with my friends in the M2M zone, enjoying informational Keynotes, and taking in what’s new in the Solutions Exhibition. 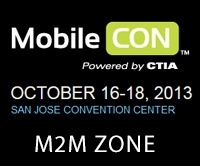 MobileCon 2013 will be held at the San Jose Convention Center. Ping me if you’re going to be at MobileCon for an in-person meet. Details about the conference here. Wireless Hall of Fame Banquet, San Diego, October 9th — Best MobileCon Networking!